Webinar focuses on how STRUMIS interacts with Hypertherm’s ProNest software. Join our experts on 23rd September, 2014 to understand how this seamless integration between the two systems can enable you to reduce waste and maximise material efficiency. What does the software integration do? The integration allows for nesting of non-linear items in ProNest directly from within STRUMIS. Users will first choose the items they wish to nest from within STRUMIS Nesting and Ordering module. Once this selection has been made and accepted, ProNest will automatically open and nest the required parts, then crop the remaining plate for archiving back to inventory, if desired. Easy synchronisation of STRUMIS’ Nesting & Ordering data to ProNest’s automatic nesting facility. Seamless integration between the two systems eliminates files being transferred back and forth. Direct and quick access to advanced nesting functionality which can reduce waste and maximise material efficiency. Seamless availability from both suppliers and inventory. Through ProNest, STRUMIS can provide data to virtually all machine brands and models. Through STRUMIS, ProNest can nest parts supplied from major CAD authoring packages. 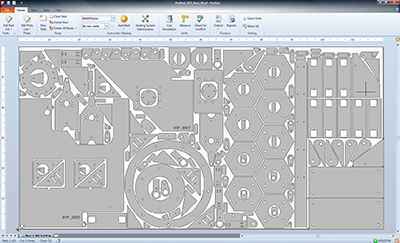 True shape recognition of components and sheets. Utilisation of desired 3rd party nesting software.